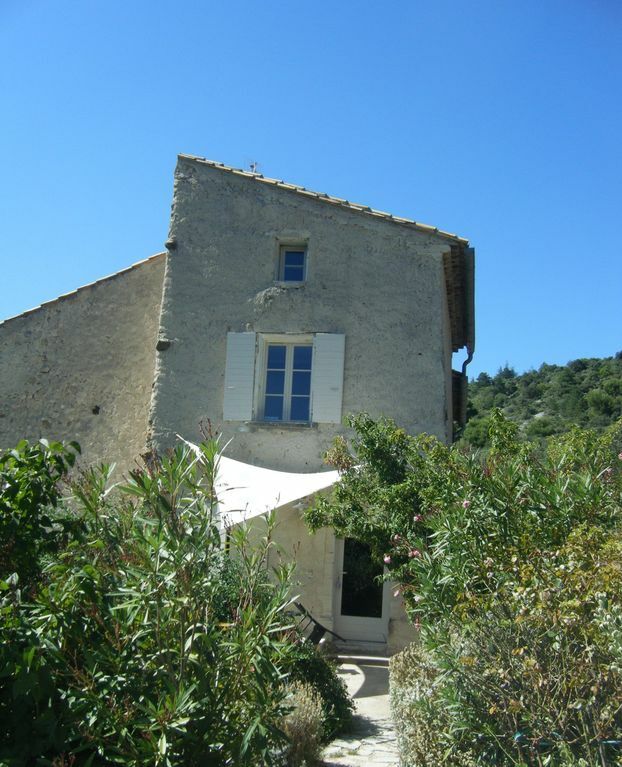 In an exceptional setting, 2.5 km from Bédoin, at the foot of the mont Ventoux, gite for rent in a 12th century papal farmhouse. Peace and tranquillity guaranteed. Fully renovated, this gite sleeps up to 6 persons and comprises: 1 sitting - dining room with a fireplace for the winter evenings; 1 fully equipped kitchen with gas cooker, microwaves, fridge, dishwasher and toaster; 3 bedrooms with 2 double 140cm beds and 2 single 90cm beds; and 2 bathrooms with walk-in shower, bowl sink and toilet. Washing machine and barbecue. From the terrace you will enjoy the stunning view of the mountains of Vaucluse, the valley of the Rhône and the Alpilles. Shared and secured swimming pool. 2nd visit. As lovely as last year. Comfortable well equipped accommodation. Spacious and well decorated with a big, solid outdoor table that has views across the vineyards over the Rhone valley. Stephanie is a fantastic host. Friendly , helpful and English speaking. She cooks evening table de hote that is superb. Home cooked from local or home grown produce. We feel welcomed, relaxed and very refreshed after our holiday. Being a cycling couple, we were keen to do the cyclists pilgrimage of Mont Ventoux; hence why we chose to stay at the house in Pierravon, Bedoin. This has been one of our very best holidays. The house was lovely, very comfortable, spotlessly clean and well equipped it is prettily decorated in a rustic French style suited to its age and location. Externally, it is set in lovely gardens and shares a very pleasant pool with guests staying at the B and B. It exceeded our expectation given the description and photographs. Stephanie is the perfect host. Very helpful, accommodating and friendly. Nothing was too much trouble. She offers a table de hote, given sufficient notice, and her cooking is superb. This was the best Provencale food we ate during our stay. The area is stunning, having much to offer cyclists and walkers and with some fantastic historical sites. The market at Bedoin is well worth the visit. We are hoping to return to this lovely property and the hospitality of Stephanie next year. Heartily recommended. We stayed in Bedoin for a week - main reason to climb Mount Ventoux by bikes. It was a great stay and Stephanie is a wonderful hostess. The house is laying about 1,9 km away from the village. The village has lots of restaurants, some shops and a small bike museum. We rented the condo, as we like to cook, but you can also stay in a room with bed and breakfast, and you can get dinners by appointment. We enjoyed a dinner one day cooked by Stephanie. It was excellent. It is a very relaxing and peaceful place. Nous sommes absolument ravis de ce séjour dans un gîte de qualité, bien entretenu avec une vue magnifique et imprenable sur la région de la terrasse où nous avons savouré nos petits déjeuners et repas! En prime un très bon accueil que nous avons apprécié! Nous reviendrons. Merci beaucoup Pascale pour votre message et votre gentillesse ! Nos amitiés à toute la famille et au plaisir de vous revoir. L'endroit est magnifique , loin de tout et en même temps si proche , Stéphanie est charmante , toujours de bonne humeur et serviable. Quel accueil , quel site , quel endroit , c'était génial. Un calme incomparable , juste de temps en temps Vanille et Hector pour nous rappeler que la civilisation n'est pas loin. On a même prolongé via les chambres d'hôtes elles aussi magnifiques , c'est sur , nous reviendrons chez Stéphanie. Le cadre est magnifique, le lieu est fonctionnel et aménagé avec goût... Merci pour votre accueil et votre gentillesse. Un grand merci à vous pour votre commentaire et j'espère avoir le plaisir de vous accueillir une prochaine fois. Paiement de l'acompte à la réservation. Le solde de la location doit être réglé au plus tard le jour d'arrivée ainsi que la caution qui sera rendue après état des lieux. Forfait ménage 50.00 € obligatoire.